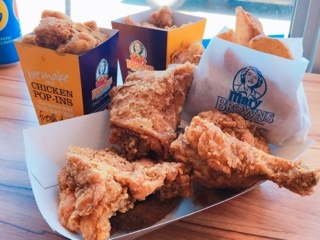 Mary Brown’s Famous Chicken and Taters has undergone a rebranding, complete with new logo: Mary's lost her bonnet and sports a blowout bob instead. 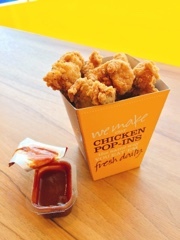 If you live in Toronto’s downtown core, it not surprising if you’re not familiar with the fast-food chain. Growing up in Scarborough, I’ve had my fair share of take-out from the Canadian restaurant, generally located in the suburbs. Subsisting solely on the chicken and taters as a child, the grand re-opening party was my first taste of their chicken pop-ins ($5.39), Big Mary sandwich ($5.49), and poutine ($7.99)! My how Mary’s evolved with the times. 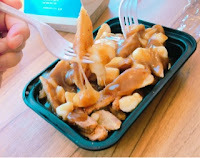 The pop-ins and poutine could easily be combined to make a winning combination: the chicken bites moist and well breaded, while the poutine smothered in hot gravy so the gooey cheese curds really gets a chance to melt. Put the two together and you’d have an epic poutine! 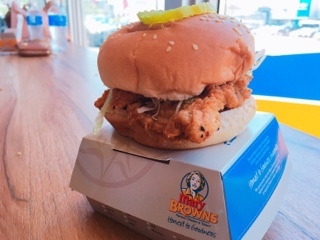 Meanwhile, the chicken patty on the sandwich is thick and actually a slice of chicken breast – it can flake a part and isn’t the formed burgers found at some competitors. Although the Big Mary sandwich provides a choice of regular or spicy, the latter is really just the addition of sriracha mayonnaise on top. Presumably, using the same patty is much easier for their operations, but takes away from the spicy experience as the spices aren’t actually worked into the batter. As for the taste of their famous bone-in deep fried chicken and taters itself ($6.99 for three pieces and taters)? 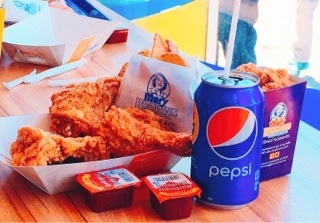 It was just as salty and moist as I remembered … the dry non-greasy skin giving way to the hot chicken juices. However, I think Mary’s done something to the breading recipe as it’s not nearly as crusty and crunchy as in the past. Indeed, their prices are a couple dollars higher than the Colonel, but the quality is also a step above. After all, even without the bonnet, Mary can cook … honest to goodness.